Tiny Farmer's screen printed Goat on a Bike image. This has the most cute graphics ever!!! Good quality shirt. Very happy with my item!!! 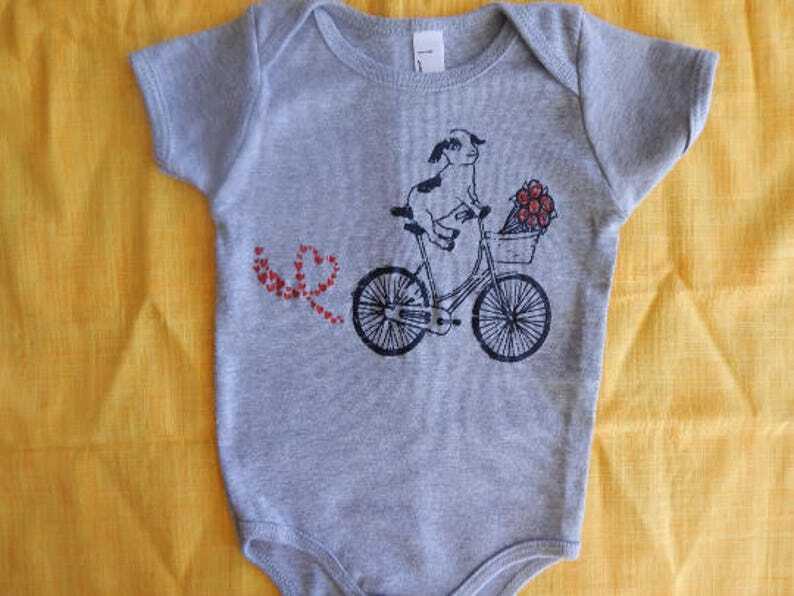 Cute onesie my preggo friend will love; fast shipping, too. Great quality, I would definitely purchase from this seller again! I bought this shirt for my brother for xmas and he loves it! Very soft. Shipping came fast. Everything is as described. Recommend! We accept PayPal and Etsy Direct payments & Etsy giftcards. Sales tax @ 8.6% will be charged to orders purchased within AZ only. Each item is printed specifically for your order. Orders may not be canceled. If an error is made on our part, we will work quickly to correct our mistake and send out the correct product. All sales are final, we do not offer refunds at this time. We DO accept items for SIZE EXCHANGE. All shipping costs are the buyer’s expense and responsibility. Please READ and follow the exchange policies. EXCHANGE: Please CONTACT US via convo BEFORE returning an item for exchange. We will exchange any item within 10 days of customer receipt. The item(s) must be in NEW, unworn, Unwashed, undamaged, smoke free condition. >>>EXCHANGE SHIPPING: ALL SHIPPING COSTS ARE THE BUYERS EXPENSE & RESPONSIBILITY. We will send an invoice for shipping charges once an exchange item is received. We do our best to keep ship cost as low as possible. ***SMOKERS/Smoking households: If our item lived in a smoking household or vehicle even for a brief time, it is highly unlikely we will be able to accept it for exchange. Custom orders & SALE ITEMS where indicated are not refundable or exchangeable. If you placed the order by selecting the CUSTOM LISTING it is not exchangeable. We reserve the right to refuse any item for exchange if any of the above polices are not followed. Thank you for your understanding. By purchasing from our shop you agree to our terms and policies. >>>PLEASE READ your order confirmation for the SHIP BY date. This is the latest possible ship date for your order. For any request outside of this timeline pay for the RUSH listing or message us to upgrade your ship method. A requested delivery date in the notes is not sufficient to rush your order and does not guarantee processing outside our listed timeline. Thanks for your understanding. Processing & Ship time: Default ship is USPS First class mail. Each item takes 5-7 business days to process before it is shipped. That means it could take up to 7 business days to process your order before it leaves our facility, then there is time in transit up to 5 (business) days. This is not calendar days. In a majority of orders processed, SHIP & Processing TIME IS MUCH SHORTER. RUSH ORDERS: In many cases, rush orders can be processed for an additional fee. >>>PAY for RUSH processing and shipping via the listing in the DIY section. SHIP TRACKING: You will receive shipping confirmation with tracking link once your package leaves us. Lost or stolen packages: Please contact USPS for issues with lost or stolen packages. International orders: Send us a message before placing your order if you'd like to pay exact ship cost, as opposed to receiving refund for overages. In the event we overcharge you for shipping, we will refund differences greater than $2.00 once the package estimate is available. We are not responsible for any other shipping or international fees once the package leaves our facility. All shipping costs are the buyer’s expense and responsibility. SIZE, SIZE, SIZE>>>Always refer to the SIZE CHART in each listing, convo us if you have SIZE questions. WOMEN: Please read size charts with care. Customers note the women's t-shirts run small. If not used to designer cut women tees, opt for the unisex version. MEN/UNISEX SIZE: Men's/Unisex products are true to size compared to other makers. WASH/CARE INSTRUCTIONS: See label instructions for care. Some items may not be pre-shrunk. Each item promises a long life if handled with care. The screen print image will not be affected in the wash.